Don’t be a victim, be prepared. It does not matter if your organization is a global corporation or a small business – each one is at risk. Any computer network that is connected to the internet is vulnerable, and no one is immune to an attack. According to AlertFind, an astonishing 700,000 new threats are identified every day and experts expect it to keep growing. 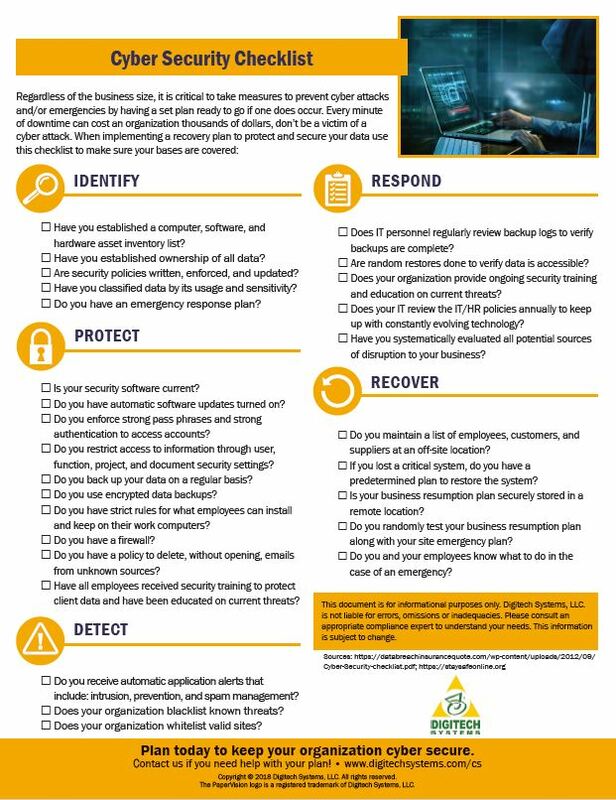 It is critical to take measures to prevent cyber emergencies by having a set plan ready to go if one does occur. You may be starting your strategy for the first time, or you may have a plan in place already. Threats and attacks are always changing, so it is highly recommended that risk assessment and planning be done at least once a year. There are five key areas in data security measures each organization should consider. Use this cyber security checklist to learn how you can better protect your data from cyber attacks. Digitech Systems offers Enterprise Content Management (ECM) software options to enable businesses of any size to more effectively and securely manage, retrieve and store information of any kind. Protect your organization today and put a security strategy into motion!